My mother grew up in a charming, solid, Craftsman style home , a style influenced by the English Arts and Crafts movement as well as by Oriental wooden architecture, made popular from 1905- 1920. This style would have suited her father, a serious Scottish student of architecture, and a draftsman, a man who was at ease with the rigidity of straight lines and angles. Upon immigrating to Canada, Grandfather James, would work with the City of Vancouver, designing and drafting many projects. A man of few words, grandfather spent hours building and shifting the classical structure of the house to suit. The child recalled that although her grandfather, “Boombah,” wasn’t much of a communicator, his mind was sharp and his watchful eyes held a flair for detail. In carpenter overalls, a hammer hanging from the leg strap or back pocket, Grandfather James was always building and creating projects throughout the house. At one point he raised the original bungalow, creating a basement area. Birthday parties would be held in this space. The child enjoyed wandering silently, following her grandfather about the back yard, watching him repair the fencing, hammer on a post, or sketch his plans onto a scrap. Grandfather would hand her the tape measure or thick black pencil, motioning with his hand when he wanted its use. The intuitive child understood the man’s grumbling ways and quietly followed him about the yard. Occasionally the child would help locate his false teeth, usually left on a pile of lumber or a fence post in the back yard. Although they rarely spoke, he would smile and nod. The child knew that she was watched over and that in his odd, curious, silent way, Grandfather cared for her. The sidewalks on West 13th and Camouson are now shaded by majestic oak and elm, their long branches reaching across, joining together, to form a canopy over the sidewalks. Every autumn, their spirally arranged leaves drifting and blowing to the boulevard were raked up into a high pile. The nuts a welcome winter meal for chipmunks and squirrels, the pile of leaves scattered and tossed by the children from the block. From a young age, children played on the front lawns of the properties. Mothers relaxed on the front steps or went about their daily business inside the house; knowing that their children were safe. 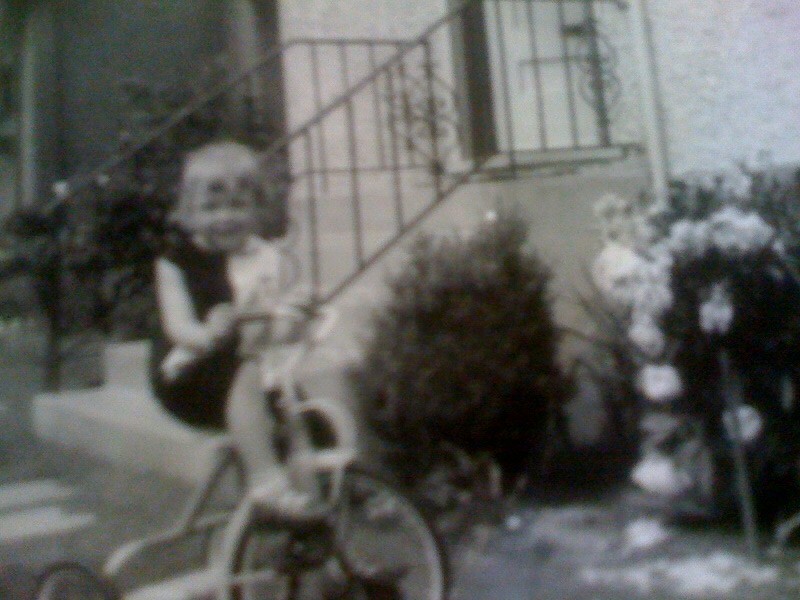 No one feared abduction from the front lawn. If a child strayed to the sidewalk or boulevard, other children, pulling and riding wagons up and down the 13th Avenue hill, protected one another from harm. There were the occasional falls and bumps, which were largely ignored. It was on this sidewalk, in the late afternoon that the child would patiently wait for her uncle to appear arriving home after his studies at UBC. These were happy times, small gatherings of family and friends chatting on the sidewalk or doorstep of her grandfather’s home. The child watched her uncle and a friend toss a rubber ball into the sky, so high, she thought it would touch the sun and disappear. It was on the boulevard alongside the sidewalk that her uncle would snap a photograph of the child wearing her new birthday outfit. 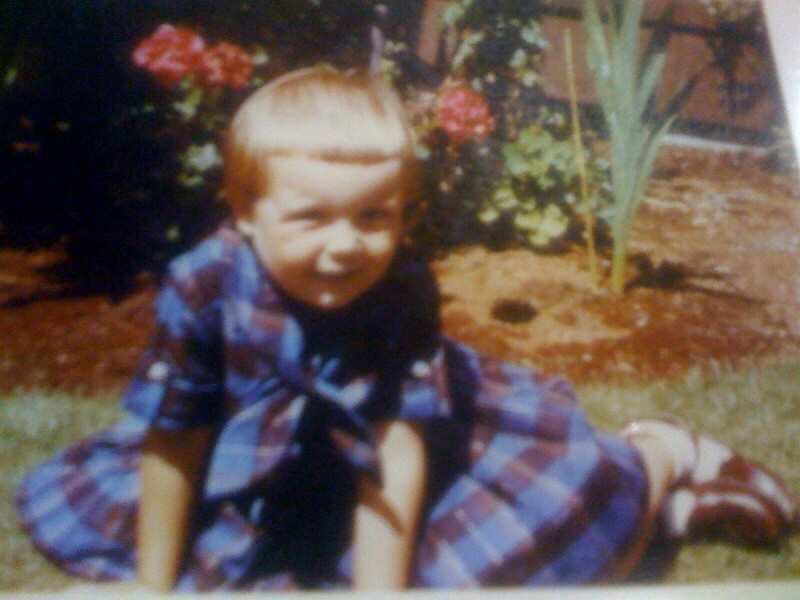 It was a two-piece ensemble, navy blue plaid top with a sailor style collar and tie at the front. The short skirt was pleated. The little girl wore white ruffled ankle socks, leather Mary Janes. Her hair was styled by Mr. Derry, the local hairdresser at the barbershop on Dunbar. The child disliked Mr. Derry’s pixie cuts but she loved the silver sparkles that he’d toss onto her head. The delight from the adults, the attention and focus made the child smile as she posed for the photograph. It was a costly store bought outfit, carefully selected by her uncle. Although, now grown, the woman fondly remembers that special day. A visitor to the house would notice the beautiful pink rhododendron bush, a genus as old as time that grew in the garden beside the front staircase. A stand out in the front garden. The ancient flowers, the color of ballet slippers. As a child; she would delight in picking up the soft, velvety petals that spilled from the drooping blooms, the dark green leaves used to scoop up an unsuspecting creature. Grandfather planted that bush when he first obtained possession of the house. Snowbells, their tiny, pure white bell shaped flowers drooping to greet the seeds germinating beneath the earth. Among them, stood the tall foxgloves, purple, and pink. The child slipped the soft flowers onto her fingertips and delighted at her velvety nails. Sometimes she was a tiger, stalking quietly through the ferns, peeking from behind the branches of the rhododendron bush, claws spread open to frighten her prey. On other days, she was a wicked witch with long petal fingernails; one touch would poison Bear and send him into a deep sleep. There was a blood red, climbing rose that inched up the side of the house. The child pretended that the rose climbed up the castle walls. Some days, she would collect the spent petals and flowers and hand them to her mother, who would arrange them into a glass bowl on the kitchen table. Before her time, another little girl, the child’s mother would explore the garden; walk the dirt paths around the perimeter of the house, imagining herself as a woodland sprite or a graceful cat pacing through the tall grass. Daffodils, their lemony colour as bright as the sun bloomed in the garden under the growing rhododendron bush. Purple, pink, and blue hyacinths scattered throughout the front garden, their intoxicating perfume scenting the air. Plantings were left in a natural state with many of the varieties native to B.C. and grandfather would journey to Hyland Barnes to select his plantings. Mother would share, “The old man really liked gardening; he was into it with a vengeance.” There were several fruit trees throughout the backyard, a plum tree that the child’s mother would later pick plums to preserve. An unfortunate pear tree that rarely produced fruit, surprised the family the year it produced a single, magnificent golden pear! “A rather puny apple tree that always produced sour fruit, covered in blemishes,” attempted to survive throughout the years. Like her daughter, the child’s mother would pick the rose petals from the ground and artfully place them into a glass bowl on top of the table. The child could watch a variety of creatures make their home in the garden. Spiders spun silken, glistening webs between the branches of the rhododendron bush. Ladybugs flew to the daffodils, tickled the child’s finger, until taking flight. Bees buzzed busily amongst the lilac bushes. The child pretended that they were making honey for her bear. Worms could be seen, wiggling up to view the world beneath the garden flowers. Black ants marched in line and the child would patiently follow them to their hill. Treasures, such as the tiny, turquoise robin’s eggs that the child found on the ground beneath the tree. Simple gifts from the universe. At the top of the front cement stairs there was a landing, sheltered by a wide, enclosed overhang with decorative post supports. This sheltered porch provided a certain solidity, protecting the little child and before her, her mother, arriving home from school or play. Entering through the plain, cream coloured door, a guest would notice the small foyer and to the right, a living room behind leaded glass paned doors. The squeaky oak floors led down a hall to the kitchen. The child would sit in the nook at the south end of the kitchen, watching the birds alight upon the cherry tree. A robin, flying by, looking down upon the low pitched, gabled peak, would see a beautiful cherry tree in the centre of the back yard. A perfect home for a stick formed nest to hold and protect the tiny blue eggs. The cherry tree changed with the seasons. In the spring, the branches would sag with the weight of the snow-white blossoms that hung from the branches. In the winter, the tree stood bare and stalwart, a solid, sentry sheltering the house from the elements. When the wind blew, the branches that reached close to the house, would tap upon the windowpane, both frightening and yet calming to the child. Was there a spirit outside the window? It was this majestic cherry tree that entranced the child. Every morning she woke to its beauty. Every evening, the child would take comfort in knowing it would be there when she awoke, an old friend. This beauty took center stage; it’s brownish black bark, rough and scratchy upon her velvety soft cheek. The branches reaching toward the sun and stars at night, the child imagined that she could climb to the very top of a branch and pick a star into her tiny, plump hand. Some days, standing upon the back porch, you would see the child, book in hand. Tossing the Little Golden Book toward the centre of the cherry tree, the child would delight when the impact occurred. Like snow, hundreds of little bits, exploding and scattering white blossoms, flurried toward the ground. Sometimes, the child could convince her sister to stand under the majestic cherry tree. When the blossoms fell, her sister would dance and twirl with delight, her arms lifted above her head, peals of laughter. Always, this game would end in tears, as the book would miss the branch or rebound, finding its target, whacking the little, round, blonde head. The cherry tree watched over the child as she sat under it, back touching its trunk, reading a book. From her bedroom window, the little girl could see it, underneath an ebony sky, the white blossoms of the tree, illuminating the deep, dark yard. Upon nightfall, the precious child sailed off to dreamland, her mother’s calm voice reciting the poetry of Eugene Field’s, Wynken, Blynken and Nod; the melodic rhythm of the words luring her to sleep. “The garden never looked better than when your father lived with us.” My father, experienced as a bricklayer for a time, replaced the drab, yellowing, brick fireplace. On either side of the fireplace there were doors inset with leaded glass panes, “horrible to clean,” my mother would lament. Curios and vases were placed on the shelves inside the cupboards. Dad discovered a cracked plaster wall in the living room area and covered it with walnut wainscoting to elevate the room’s stature. My mother felt that, “The place looked quite decent once your father fixed it up.” The flooring was oak hardwood, which seemed to squeak with each footstep. My uncle and grandfather had two small bedrooms on the upper floor of the house. There were two small attic doors, which led to creepy areas under the roof. One terrified neighbourhood child ran off after my uncle opened the doors to show the bear in the attic, which was actually a small bearskin! Many years later, my uncle would send me a letter stating, “It was a very good time for all of us in that house, by far the most pleasant time your mom and me had ever experienced in that rather unhappy house. Your dad’s presence really curtailed much of your grandpa’s angry behavior. This was a great benefit to all of us, including, Boombah. Looking back it was a wonderful time for all of us. “ These were happy times for us, a family full of hope and promise.